Is it possible to mix and match reception room chairs or is it best to choose one model and style of chair only? The styles and types of reception room chairs from arms to no arms, wing back chairs to rockers is really a personal decision. Mixing and matching different types of chairs while staying with a uniform color scheme can be a great option to allow your patients to select a chair that is most suitable to their needs. Having bariatric chairs is also an important consideration in every type of medical setting to provide patient comfort and safety in all rooms in the facility. What are the possible colors of upholstery for reception room chairs and are there different types of frames as well? Reception room chairs from different companies and manufacturers may offer a range of different colors and materials for both the upholstery and the frame. Most will have wood, metal or polyurethane materials in the frame, while some may have a combination. Typically the arms and armrests will be polyurethane with the actual frame itself being metal. These types of chairs come in a variety of frame colors from neutral creams through to very deep blacks. 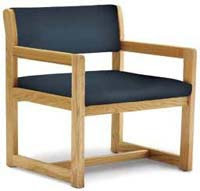 Wooden frame reception chairs may be ordered in a variety of stains and wood finishes. These can include light oak, medium oak, mahogany and walnut. All the colors will work with the upholstery selections offered, it is really a personal preference and décor coordination issue as to what color is best suited for your particular reception area. Upholstery colors usually include solid colors from creams through to the royal blues and deep forest greens. More muted colors such as sage, sunset, ice and jade mist provide a softer visual impact that coordinates well with most medical settings. 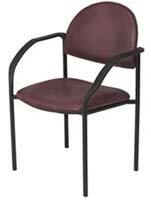 I have seen almost bench types of reception room chairs, are those specialized for a particular patient use? Most of the reception room chairs that appear to be larger and more bench like in design are actually bariatric waiting room chairs. However, these chairs come with different weight ratings from six to eight hundred pounds, so they are very suitable for chairs for kids, families or more than one person on the chair. They are ideal for pediatric offices where moms and dads may have infants, toddlers or young children that are uncomfortable sitting on their own chair. The kids can sit with mom or dad and share a book or just sit and cuddle before the appointment. These larger reception room chairs, many which have 36 inch seats as opposed to standard just less than 19 inch seats are also very comfortable for patients that are transferring from wheelchairs or assisted mobility devices such as scooters. The additional space on the seat provides support as well as decreases the chance of a slip. Most of the larger bariatric types of chairs will have full arms, also providing safety and security during transfers on and off of the chair.